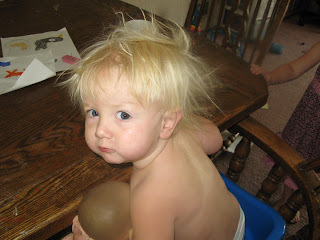 Here's Little Eva's daily case of bedhead. She also looks like this when getting out of the car, no matter how much I brush her hair. 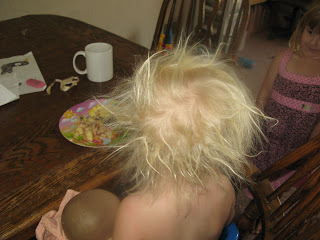 But, hey, at least she HAS hair, unlike her Papa Dave, whose birthday is today! The countdown is on for Baby #5 (due on 10/10, our anniversary), so if you see me skipping posts anytime soon, you'll know it's because I'm nursing nonstop. I'll try to be a good Bloggy Friend and post new-baby pix as soon as I'm able!